I've updated the first post with all the latest pictures and links. the presentation topic link doesnt go to my review i did on the zig zag stairs? No, the presentation topic isn't for a review, it's for presenting the instructions. Courbet's post is where the instructions are presented. I guess it was easier back when I was doing all the instructions to all the presentation topics were my own posts. It is a bit more convoluted now. ah ok things make sense now, but maybe you could add it under the presentation topic link so people can find a good review on the module. I built the cup to cup type2 module today. Thanks to Courbet's instructions, I built it too easy. I finished all the modules of the Akiyuki project. has anyone tried to do ball factory?? Can you tell me what part you used for the cups on the cup to cup module? as anyone tried to do ball factory?? At which part(s) you do have problems to build? I have build the Ball Factroy twice now, without any problems. The Timing and continous running is the most difficult part. Nothing at the moment. Regarding Superfin, I thought it was your turn to present us how to build the Step Tower module. Maybe I missed it? By the way I second Boulderer's question, what cup part did you use in your Cup to Cup module? 1 Mark & 1,5 Question. In the picture of the Unloader V2, I see 2 different shock absorbers, am I right or does it not matter, using 1 hard and 1 extra hard? Is it also possible to use the shorter ones? I ask because the large shock are very expansive to buy and not avaible at Lego, the short are cheaper and available. Although Akiyuki used two extra-hard and ultra-expensive shocks, one hard and one extra-hard were all I had at hand when I built my replica. It's obviously better to use two of the same kind but not that crucial. The unloader will also work with 2 soft ones (black or dark grey, much cheaper than yellow ones) - it still works without any shock at all actually! Using shorter shocks might be possible although I don't see a way to do this easily. As always, MERCI!! Courbet, for this usefull help. My version of the Cup to Cup using turntables. The only brick that is the same with the Akiyuki version is the cup itself and nothing else. Neat as always, Berthil, but not cheap to replicate! The way the turntables are fixed to the frame is very original. Berthil is there any reason as to why you have the akiyuki input part but not the black thing that connects to the next module at the end? About the necessary offset between turntables, did you try a studless frame using part 64179 (which you must have in large quantities now!) with only a 1/2 offset between the turntables? The only brick that is the same with the Akiyuki version is the cup itself and nothing else. You mean that black square? I don't like that black square, it think it looks bulky and hides the balls, I also left it out on the version 2 train. You're right, I have a lot of the 64179, I already did a tryout to make some kind of 3D maze out of them and use it as a 3D pinball in a new module. I could not get the right distance with the 64179 because the distance between the turntables to intermesh is not 1/2 offset but 1/4 which can be achieved with the two neck braces. I'll add the photos to my original post. I like my version best of course :) looks smoother and the diameter of the turntables and overall ball travel is 7 studs instead of 3 studs of the Akiyuki version 1, for me this enhances the already nice cup to cup effect much more. The turntables enables an open structure without being cluttered with gears. 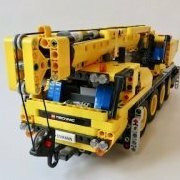 so it looks like i have found another website selling instructions for these modules. can someone on here shut it down? My version of the Cup to Cup using turntables. Very nice interpretation! An excellent use of newer parts to achieve the same effect, and it has the same good, clean lines as a real Akiyuki module. Nope, I see some 9L black beams in there that Akiyuki also used. I'm just surprised that you need those neck braces to mesh the turntables. Are these the 60z or 56z turntables? I assume that you couldn't get either to mesh properly without "tricks"? Thanks! 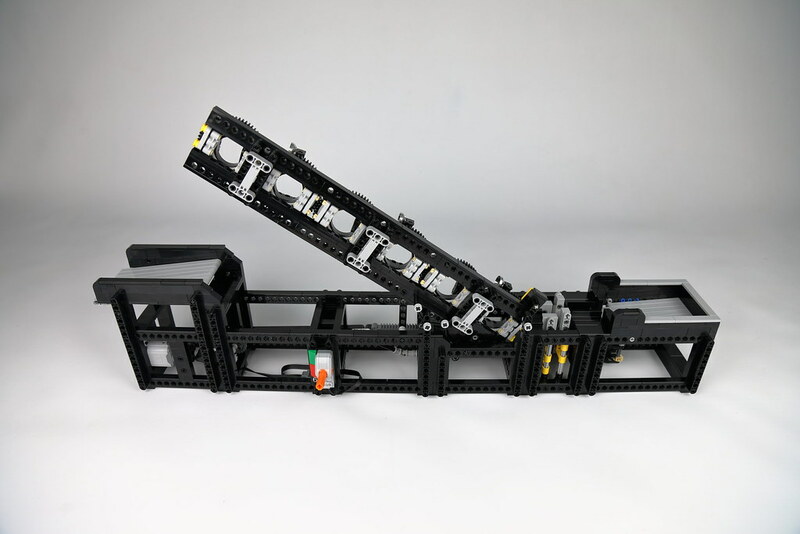 Yes, a 1/2 offset achieved with 1x1 technic brick or the 1x2 with two holes did not work, it needed something between that. These are the 60 teeth turntables. But indeed, the 18492 gear rack I used is available for 2 years now. 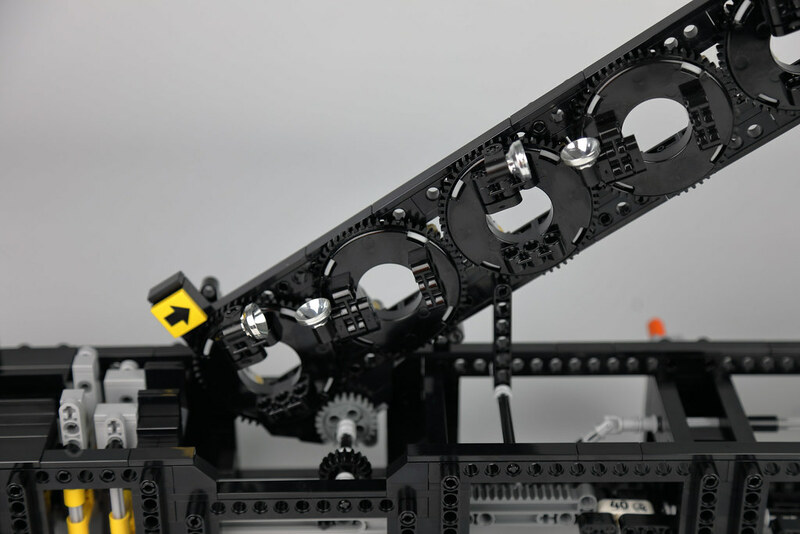 My other two attempts to create it with a 64681 gear rack resulted in a somewhat jerky movement or too much friction. 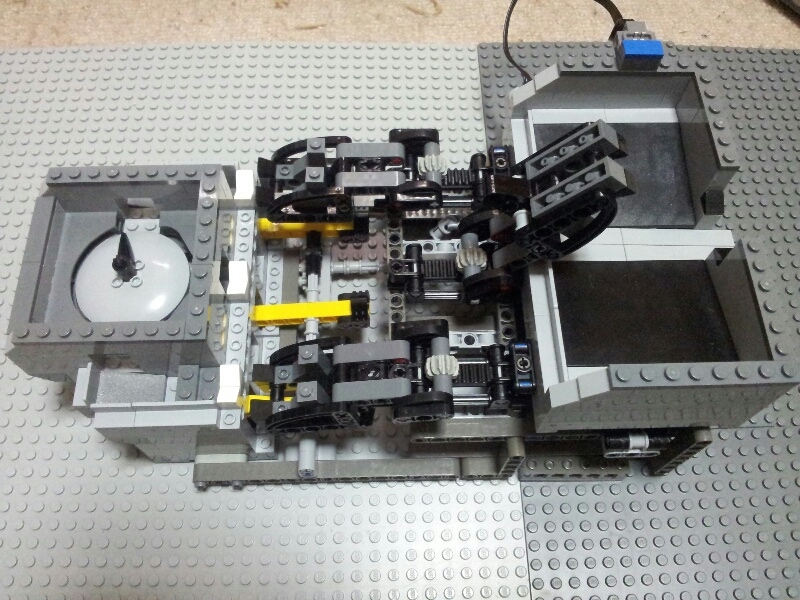 Hi, while I realise this doesn't really fall under the "umbrella" of GBC has anybody tried reverse engineering or possibly making instructions for Akiyuki's axel sorter or 4, 5 or 6 axis robot.